Clearly, the acquisition of Marvel has paid off in spades. Building off of the ginormous success of Marvel’s The Avengers, Disney effectively marketed Iron Man 3 as powerful and compelling. 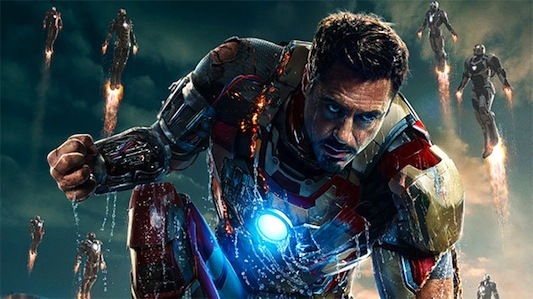 Despite following what was arguably the biggest film of 2012, Iron Man 3 managed to deliver what the public wanted in this second superhero sequel. The buzz could not have been higher and the generally positive reviews helped its case. No film beat Iron Man 3‘s box office business. The Robert Downey, Jr. film debuted with nearly $175 million domestically and eventually raked in some $1.2 billion worldwide total. Disney has now leveraged off of the Iron Man brand by integrating Tony Stark into its theme park division (the Iron Man Tech exhibit at Disneyland’s Innoventions) and Disney Consumer Products (all those toys scattered around Disney Store). Similarly, Disney’s other pic from Marvel has taken over the globe. As of the release of this article, Thor: The Dark World has almost reached $600 million globally. It appears the only thing that could stop Thor from pulling in more would be Loki’s wrath. As Iron Man 3 benefited from the post-Avengers period, so has Thor: The Dark World. 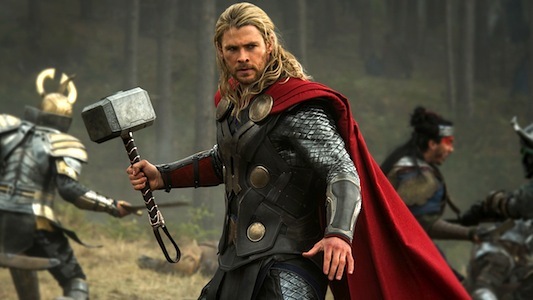 The Chris Hemsworth vehicle has received many positive reviews (currently holding a 65 percent on Rotten Tomatoes) and quickly improved on the first film’s $450 million total earnings. Both Iron Man 3 and Thor: The Dark World have accounted for close to half of Disney’s global box office numbers for 2013. The combined grosses, and overall high regard for these properties, speak to the value of Marvel as one of Disney’s banners. Not since 2004 has the company released one film from each of its animation houses (Walt Disney Animation Studios, Pixar Animation Studios and DisneyToon Studios). Back then, films from Disney animation were produced from the alternatively-named Walt Disney Feature Animation and suffering big time – remember that the maligned Home on the Range premiered that year. Pixar was not even officially owned by Disney then. That year the Mouse House released The Incredibles. Even DisneyToon Studios lacked commercially-appealing content, releasing the box office bomb Teacher’s Pet. Almost a decade later, and these three combined brands are better than ever. Walt Disney Animation Studios just released Frozen, absolutely fantastic in its storytelling, music and characters. The public has responded very favorably to the winter-set pic, as the epic grossed over $90 million in its first five days of nationwide release. Frozen could easily beat Tangled‘s approximately $590 million worldwide total by the end of its run. If so, and at this point it may be too early to determine, Frozen could be the most successful film from the studio division (from a box office standpoint) since The Lion King. Wow. This is especially surprising, considering the fumbles Frozen made in its advertising (not really showcasing the story, but instead just highlighting the humor). Luckily the public saw past that and has embraced the film’s ultimate value. 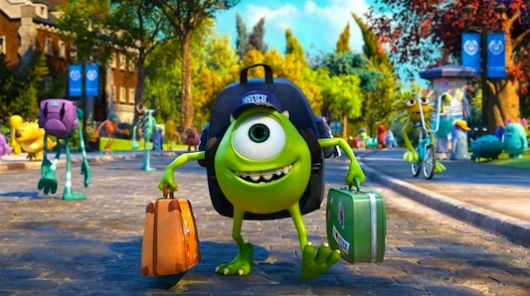 Monsters University, Pixar’s 14th feature, earned good reviews – though not outstanding – and yet the public showed their love for Mike and Sulley. The Pixar prequel scored over $740 million worldwide. That’s big business for some characters who had not been on the big screen in more than a decade (discounting the 3D re-release of Monsters, Inc. several months earlier). Disney’s great marketing campaign here, which used the college atmosphere as the basis for many of the jokes and storytelling techniques, worked. As for DisneyToon Studios, the brand that had released Disney disappointments like sequels to The Fox and the Hound and Cinderella, has emerged as a fine contender that can rival other animation houses. DisneyToon has been churning out well-received Tinker Bell films on home video in recent years, and saw the potential of Cars spin-off Planes for a theatrical release. Good move, as while Planes was damaged by less-than-favorable reviews, it failed to fly under the radar of families seeking solid entertainment. The high-flying pic grossed nearly $90 million domestically – and over $200 million worldwide. Get ready for Fire & Rescue, the Planes sequel, to perform well next July. 2013 has featured limited entries from the main Disney brand, but nonetheless it has seen mixed levels of critical and financial success. Yes, Oz the Great and Powerful failed to reach the Alice in Wonderland-like business Disney had hoped for, but the James Franco film managed to pull in almost $500 million worldwide. It dominated the box office for much of March and will likely see a sequel. 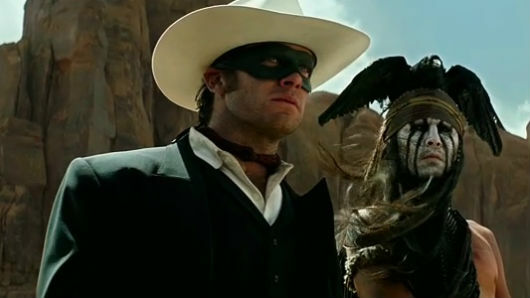 On the other hand, The Lone Ranger was more of a bust and went ka-boom in the minds of studio execs. Few people showed Johnny Depp and Armie Hammer some love for this Western action-adventure. Everyone seems to ignore that the Jerry Bruckheimer production still accumulated some $260 million worldwide, as Disney’s huge write-off on the film downplayed any positive news. But with big risks come big gambles. It paid off for Oz, but sadly not for Ranger. The lone other release distributed under the Disney banner this year is the highly-anticipated Saving Mr. Banks, which has garnered much praise for its leading performers (Emma Thompson and Tom Hanks) and possesses a strong rating on Rotten Tomatoes (from early reviewers). Come later in December, we will see how audiences flock – or do not flock – to see this film, essentially the making of Mary Poppins. My guess is that domestic earnings will exceed $100 million, if not for the performances, at the very least due to lack of family film competition. However, Saving Mr. Banks does come with a PG-13 rating, thus limiting some parents from considering this as an option to take the kiddos. Last, we must reflect on how the distribution of a couple of DreamWorks films each year under the Touchstone Pictures banner can fail. This year featured the disappointing The Fifth Estate, starring Benedict Cumberbatch as Julian Assange, and Delivery Man, with Vince Vaughan as a sperm donor father to hundreds of kids. Neither of these pics enticed audiences to shell out their cash. These failures contrast with the previous successes of this distribution deal, marked by 2011’s The Help and 2012’s Lincoln. We must wonder what the coming years will bring in terms of hits and money. This year boasted a limited load of film options from Disney – among the lowest in years, following Disney’s strategy of releasing fewer movies – but what it has lacked in quantity it has made it back in cash. The quality of the films has ranged from awesome (Frozen) to somewhat-forgettable (Oz), but Disney’s focus on making mostly blockbusters has scored them much praise and cash. 2014 looks to add some more middle-of-the-range hits (expect the modestly-budgeted baseball pic Million Dollar Arm and comedy Alexander and the Terrible, Horrible, No Good, Very Bad Day to perform decently. These types of films are a return to form for the studio, which this year had none outside of the “blockbuster” category. I think Disney’s film platform has shown its strength, and I applaud its accomplishments. But I also value the smaller entries on the slate alongside the mammoths. What did you think of Disney’s 2013 film line-up? What was your favorite? Share your thoughts! This is Brett Nachman, signing off. 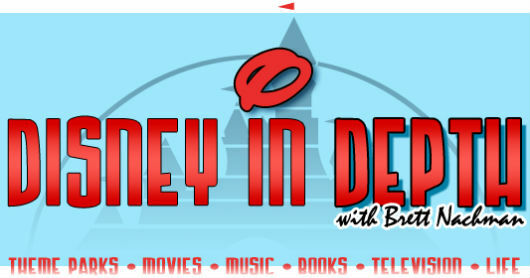 Follow me on Twitter for alerts of new editions of Disney In Depth, Thursdays on Geeks of Doom!